Every night the parents of a toddler faced with the same problem: a little difficult to put down. They just do not do: sing lullaby, and read a fairy tale, and lulled... And all the babies not sleeping. To 3-6 months develop baby clear mode of the day. Awakening, swaddling and putting to bed – all must obey the schedule. Eventually, the baby will develop the habit of falling asleep at the same time, which will be easier to teach him to fall asleep on their own. For a couple of hours before bedtime, put your baby in playtime. Try to protect the baby from anything that can excite it before bedtime. It is better if toys, which plays a toddler before bedtime, will be familiar to it: new experiences for a whole day and so abound. Their actions contribute to the child develop the right attitude to the crib: do not feed to her baby and not play with him there. The crib should be associated of the baby sleeping. Even if you ukazyvaete the baby, put him in the crib not sleeping and falling asleep. Put the crumbs and step out of his sight, let him sleep in the crib alone. Over time, falling asleep independently will be baby norm. If after you put the baby in the crib, he starts crying, try to calm him down without taking hands, Pat him, sing a lullaby, kiss... If the baby continues to cry, take on hands. But once he calms down, put it back. In the first months of life, babies sleep better if their top of the head rests on the roller rolled diaper or blanket covered the back of the crib. If next to the baby's head to put my mother's (worn) clothing, the baby will feel the presence of my mother's smell. All this affects the baby soothingly and reminded him of feelings in the womb. Baby create favorable sleeping conditions. Develop a "ritual of falling asleep" and try to stick to it every day. 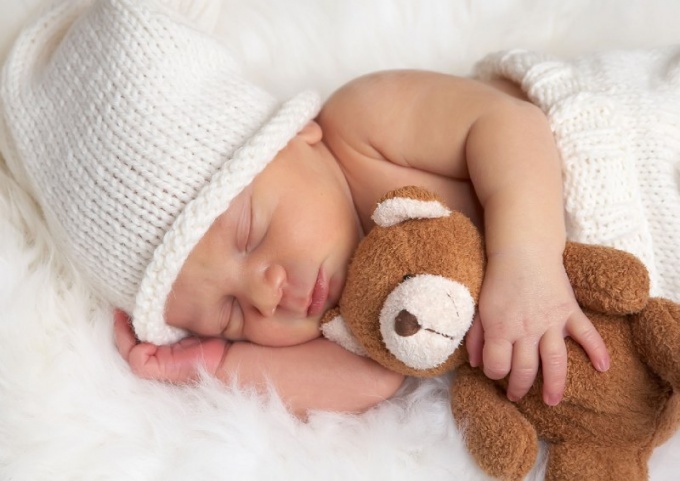 For infants, we recommend the following sequence: warm soothing bath relaxing massage – the diaper change, the last before bed feeding – a lullaby or a short story. Repeat these steps every day and in a week or two baby will get used to the ritual: he will set on sleeping and fall asleep faster. Try before sleep avoid looking directly "in the eye", the emotional contact is not conducive to falling asleep. In infants there is a special need to feel the warmth of the mother near the mother, they feel protected and safe. So if your baby refuses to fall asleep himself, it is not necessary to insist. Please be patient, the kid will grow up and everything changes.